The Jewish new year began with a little confusion because some, but not all clocks in Jerusalem were set back one hour. Perhaps too much celebrating the night before? So we got a later-than-anticipated start but still managed to pack a lot in as usual. 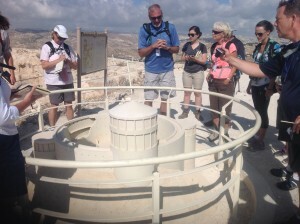 We visited the Herodian, Herod the Great’s fortress palace (just outside of Jerusalem and overlooking Bethlehem), where just seven years ago archaeologists discovered Herod’s tomb. From Jerusalem we traveled to Bethlehem and stopped at an olive wood-crafter’s shop. Our afternoon was spent in the foothills of Judah, where we visited an ancient millstone olive press operation at Tel Maresha and a first century family tomb. 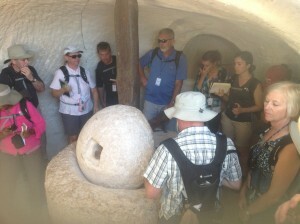 At both the Herodian and Tel Maresha we saw columbarium which George, our guide, aptly described as the first internet. Carrier pigeons don’t get the credit they deserve for being the first mode of communication for vital information between cities, but we saw where they were intricately housed. We concluded our day near Tel Beth Shemesh where Samson’s story takes place.